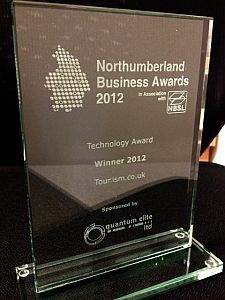 The team at TouriSM was surprised and extremely pleased to receive the 2012 Technology Award last night at the presentation ceremony held at Linden Hall Country House Hotel in Northumberland. In accepting the award Managing Director Gary Herron said "This really is great news for the team here at TouriSM and is testament to all the good work we continue to do in establishing Tour.iSM.co.uk as one of the UK's leading Tourism and Hospitality brands. Our mission is to bring cost effective online advertising to the Tourism market - but with a friendly approach that we here in Northumberland are renowned for". For more information about us please visit Tour.iSM.co.uk or call the team in Berwick on 01289 333280. To get the most out of Tour.iSM please add us to your 'Safe Senders' list. View this email in your web browser.